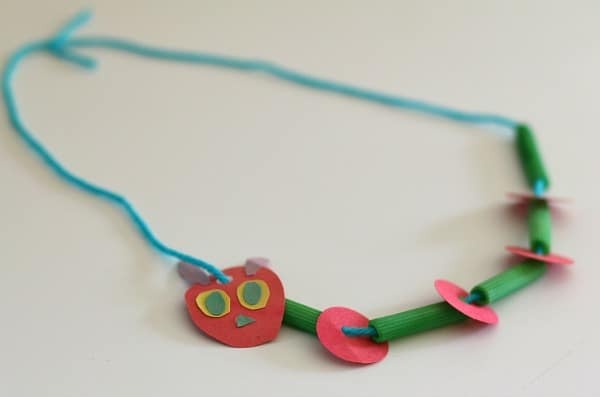 Make your own very hungry caterpillar necklaces in this fun craft for kids! 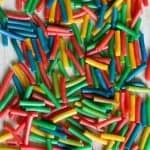 It’s a great way to practice fine motor skills, patterning, and creating. 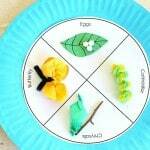 Be sure to add this easy craft to your Eric Carle, insect or bug, spring, or butterfly unit, or do it at the beginning of the school year! 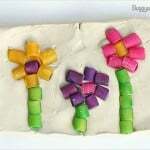 Follow our Spring Crafts and Learning for Kids Pinterest board! 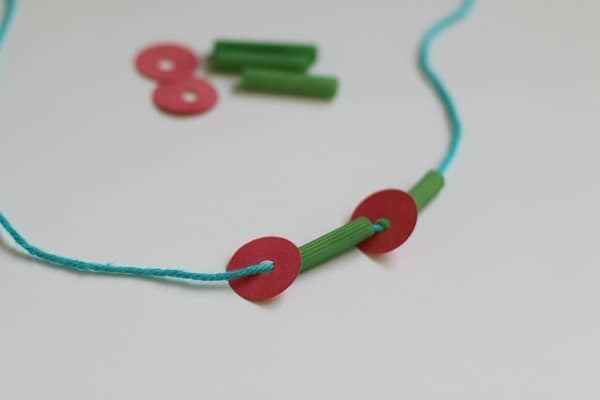 If you’re in search of a spring craft for kids with both a literature and math component, this one is perfect! Children will have the opportunity to practice patterns and counting in response to a very popular children’s story. 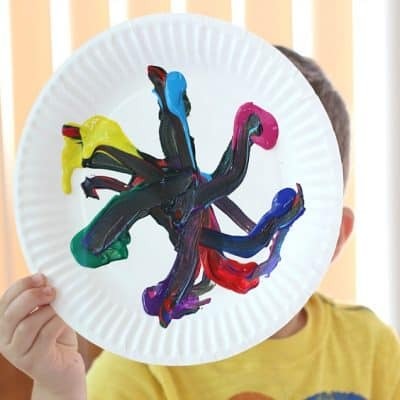 This craft for kids was very easy to prepare, and once your kids are old enough to handle scissors, they can do most of the work on their own. The best part of the craft is it allows your child space for creativity while also working on patterning and fine motor skills. 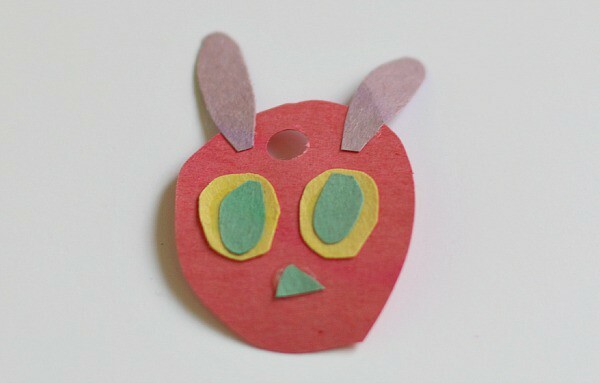 Cut out red paper circles about 1 inch in diameter. Punch a single hole in each one. Make the caterpillar’s head. (You can be as simple or fancy with this as you want. We tried to make it look similar to the caterpillar in the book.) Cut out construction paper face and glued on some eyes and antennae. Punch a hole in the face for stringing later. 4. Place some tape at one end of the yarn or string to make it easy for threading. 5. 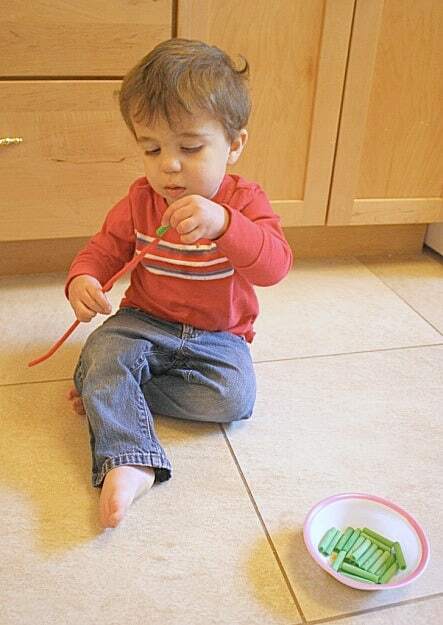 Have you child first thread a green pasta onto the thread. Next they add one red circle, then green pasta etc. forming a pattern. 6. 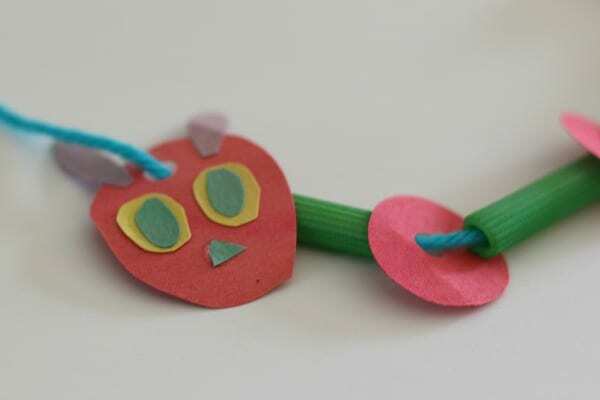 When your child is happy with his or her caterpillar length, add the caterpillar head. 7. 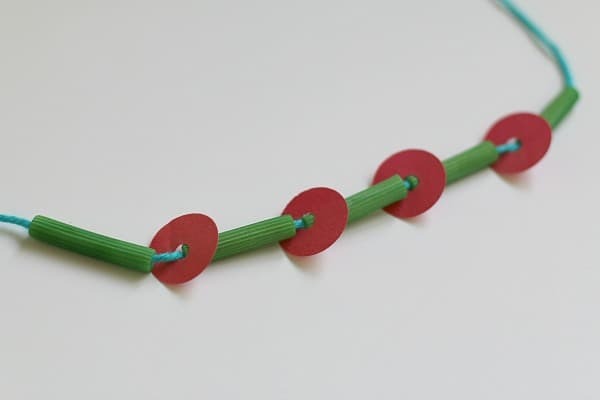 Tie the string together to form a necklace. (Cut off the tape). There’s no need to leave out the little ones. While we were busy making our necklaces, Theo practiced those fine motor skills of his by putting pasta on pipe cleaners instead of string. 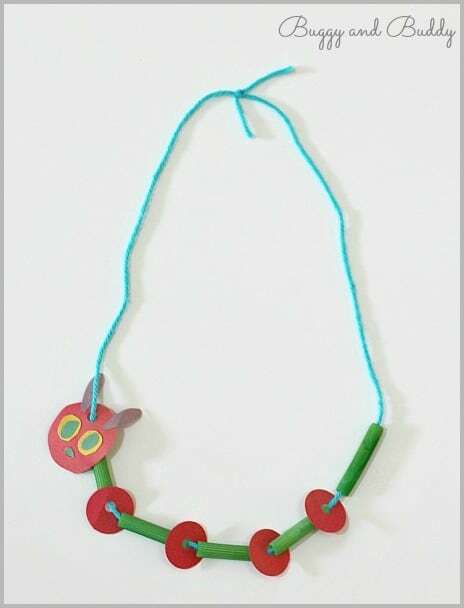 This craft would be perfect for just one child, but also easy to produce in mass for a large group of children~ a project for your child’s class or playgroup activity. When doing the activity with large groups, I find it helpful to place each individual child’s materials in his/her own small baggie. 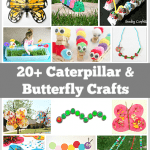 Be sure not to miss our other crafts for kids! 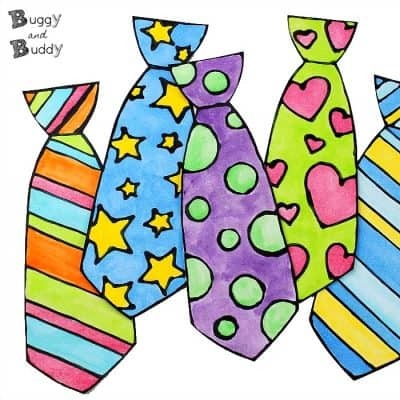 This is so cute, and I love the incorporation of patterning and fine motor practice. We’ll definitely work this into our spring theme or bug studies. Fabulous! I’m pinning this for when I have a Very Hungry Caterpillar party at the library. It’s one of my favorite books! Thank you! I don’t think Lucy ever really gets tired of it! 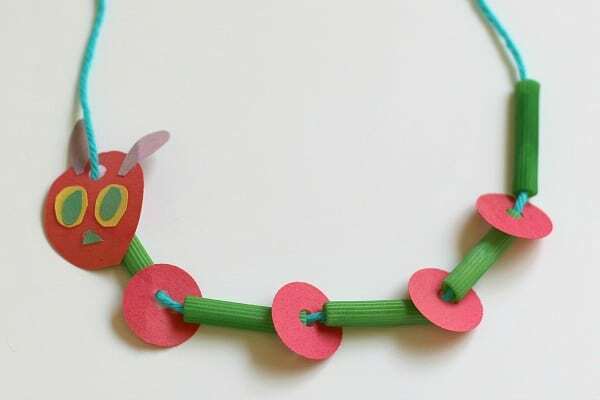 I think we have a caterpillar necklace collection going on now! Okay that is just very clever and cute! 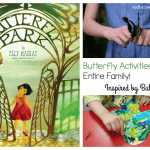 Thanks for sharing on We Made That! Hello, popping over from the GGIF linky. This is a great idea. 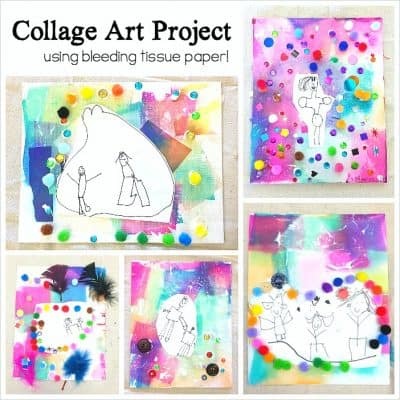 We’re donig Eric carle over the summer, so I’m gonna steal this idea!! Yay! I hope you all enjoy it! Thanks for stopping by! This is brilliant and perfect with World book Day coming up. Off to pin. Thanks for sharing. This is one of my favourite stories to use with the children I work with. Definately have to use this as a follow up activity – just brilliant! Have shared too. Such a cute idea! thanks for sharing at Mom’s Library! This is pretty cool! I like it a lot!! Thanks for sharing at Sharing Saturday! So cute! I love the hungry caterpillar. Thanks for sharing at Mom’s Library. Wanted to let you know I will be featuring this on Mom’s Library! Thanks for sharing! This is adorable! I am sharing it on our FB page!! Oh, this is just adorable! What a great idea, and perfect for the little kids! 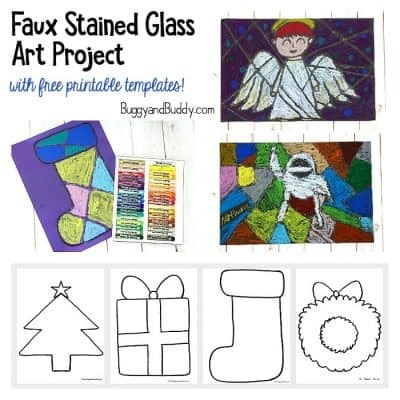 I am featuring this craft at the next For the Kids Friday link party over at SunScholars! Thanks for sharing with us, and I look forward to seeing more of your fun ideas! wowwwwwwww… I love this idea!!! thank you very much!!! This is such a cute & clever craft! LOVE it! I featured it this week at TGIF here: http://livinglifeintentionally.blogspot.com/2013/02/tgif-linky-party-64.html – Feel free to grab an I was featured button if you like. Thanks for linking up and sharing your creativity with all of us! Hope to see you linked up again today. This is so cute!! I love it! Thank you for sharing at Sharing Saturday! Love this! Thanks for sharing!! I would like to invite you to my linky party Thrifty Thursday! 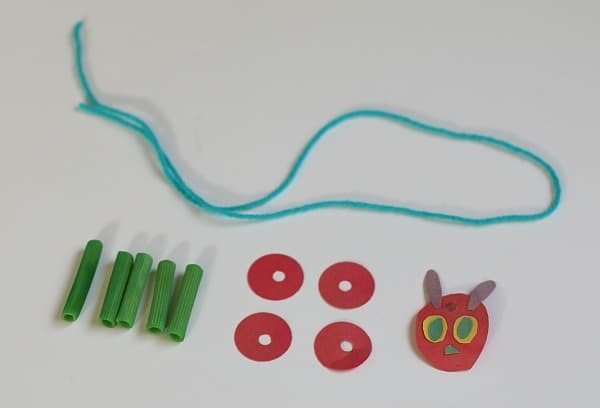 Great project, we are working on the letter C this week so might just have to make some pasta caterpillars! this is SO cute! 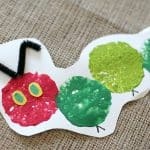 I am doing a hungry caterpillar round-up post tomorrow & will be sharing your post there. Thanks for a great idea! Thank you, Karyn! Can’t wait to see your roundup! Thanks for sharing! I just did The Very Hungry Caterpillar story and the class loved it… I’ve made different crafts in the past for this story, but not this one. I will definitely use this during our insect study week. I hope your class enjoys it! 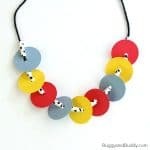 I always loved seeing my students walking around with their necklaces on all day. Too cute! 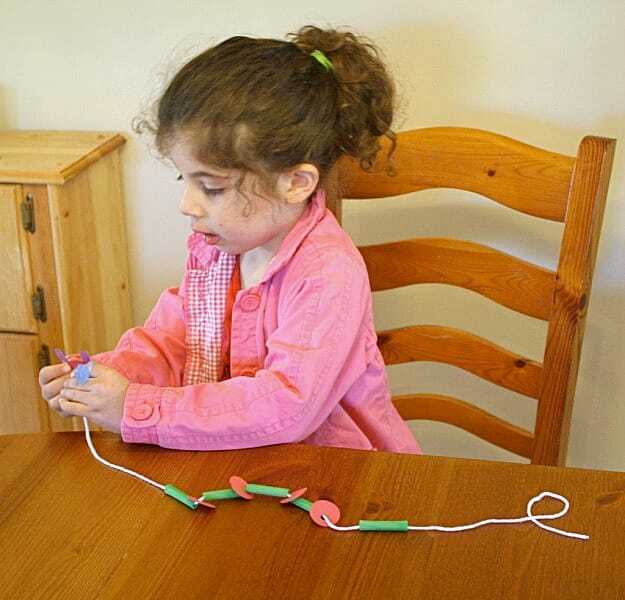 This is SO cute and a great way to build fine motor skills! Definitely pinning this one! Thanks so much, Larissa!! My students always loved this activity! This is a really cute idea! Pinned it! Love it! 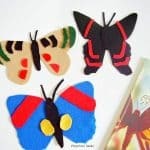 What a great craft to do when studying gardens, spring, or Eric Carle! How fun!! Such a great idea and so much fun! 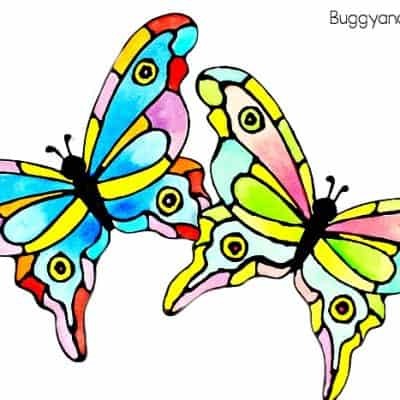 Definitely going to make these when we learn about Butterflies! Thank you for stopping by and linking over at Thoughtful Spot Weekly Blog Hop! You are featured as one of my favorites this week! This is very cute! I love the simplicity of it. This is really adorable! We love the Very Hungry Caterpillar!